After hearing about Little Free Library about a year or so ago, I was so excited to see one pop up really close to my house. I was even more excited that this one has a designated kids section! If you have never heard of Little Free Library, let me tell you a little about it. 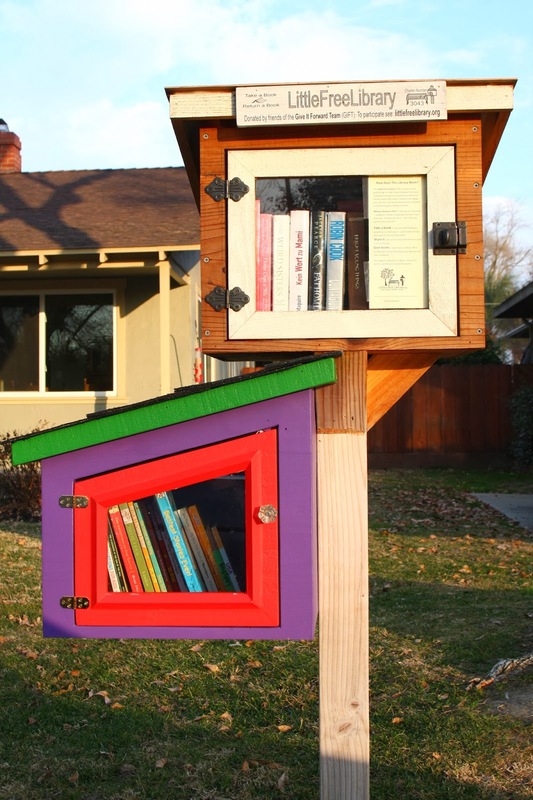 They are little wood libraries (boxes) in peoples front yards that are operated on the honor system of "take a book, return a book." I love any idea that brings a community together and incorporates sharing with each other. The reading aspect is also a bonus. The next time you are near one, you should at least drive by it. I promise, it will put a smile on your face. Or, just put one in your front yard so you can smile about it every day! I know I want one. So fun! I think it is an awesome idea! I know someone who does this and I am always amazed that there is actually books in it! This one is super cute with the kids section!! You should totally do! I think I would be way more likely to participate then! I also love the Little Free Libraries! I love seeing how many have popped up around Milwaukee. Lots of them are themed - the one I visit most frequently looks like a Chinese pagoda! We'd like to have one, but probably not in our current home. There really isn't a good place for it. A kids section, that's adorable! My sister is thinking about making one for her girl scout gold project. I'm pretty excited. I'll have to mention doing a kids section.